Between the games, demonstrations and vendors, there were so many things for you and your dog to do at PawsAbilities 2009. What was your favorite thing that your and your four-legged friend did together? We would love to read your stories! You can share them by leaving a comment. Thank you to everyone who joined us for the canine fun and entertainment at PawsAbilities 2009! We hope to see you again next year! Sunday at PawsAbilities was just as jam-packed with canine fun as Saturday. The Main Hall was filled with chatter, barking, laughing and jiggling leashes. Susquehanna Service Dogs explained clicker training, a clear way to communicate the behaviors you want your dog to exhibit. You use the clicker to pick the behavior and then reinforce that behavior by giving a reward. SSD Tara demonstrated how clicker training works. Accelerant K-9 Loki and her handler Detective Dennis Woodring showed off Loki's skills in detecting gasoline and other fire accelerants. 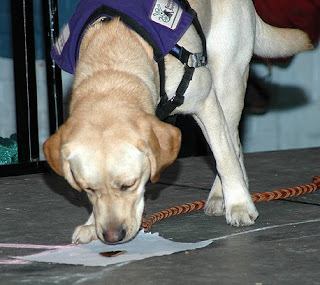 Because dogs' noses are much more sensitive than humans' noses, they can detect smells more accurately. At a fire scene where gasoline is present, Loki can locate the source 92% of the time. Compare that to people, who can accurately find it 30% of the time. Broadway came to PawsAbilities again as animal trainer Bill Berloni and Chihuahua star Chico took the stage. Chico, who plays Elle Woods' beloved Chihuahua on Broadway's Legally Blonde The Musical, appeared decked out in a pink rhinestoned shirt - the signature color of Elle Woods. When Bill found Chico in a shelter in Newark, NJ, Chico was a fierce little spitfire who scared even the shelter's guards. After Bill rescued him and brought him into a loving home, Chico transformed into a completely different dog. Now he's the first dog to "bark" lines on Broadway. New for Sunday was the flyball demonstration by Flyball Dogs Anonymous, and what a blur of energy they brought with them! To a chorus of cheers and barks, the Flyball Dogs raced down their lanes, leaped over the four hurdles, snagged the tennis ball that was launched out of the flyball box and raced back to the finish line. The excitement was so contagious, the dogs watching from outside the ring barked and strained at their leashes, eager to try out flyball for themselves. The Keystone DockDogs made an even bigger splash as they held their Big Air finals. The winning dog leaped over 25 feet off the dock! We recorded their Big Air finals, and it will be available for you to watch soon. This year's PawsAbilities was a barking success, and just the thought of next all the PawsAbilities for next year have the dogs' tails wagging in excitement! Thank you to everyone who came out for the fun and to support SSD! 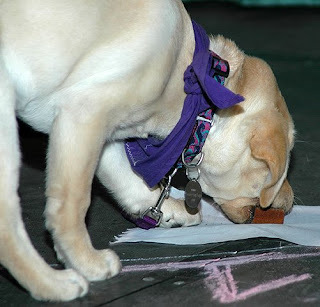 At any one time during PawsAbilities' celebration of man's best friend, you can find a number of activities going on. With 17 rings of canine activities and over 50 vendor booths, not to mention the Paw Draw, Keystone DockDogs and Rally-O, you have plenty to choose from. Here's a brief snapsnot of one hour of PawsAbilities. In Demo Ring #16, the Summit Search and Rescue bloodhounds Apache and Merit demonstrate their unique abilities to follow any scent. These dogs are built for sniffing - every part of their body functions to enhance their ability to catch a scent and follow it. Their long ears, which dangle to their nose, help stir up the scent and fan it toward their nose as they're tracking. Inside their nose, bloodhounds have 200 million cells to detect smells - compare that to the 5 million cells in a human nose! Those wrinkles and flaps of skin that are so distinctive help them wiggle loose from brush and briars, and their thickly padded feet allow them to walk long distances in pursuit of a scent. During the presentation, Apache and Merit demonstrated their tracking skills, following the scent of a young volunteer around the ring. They followed the scent right to where she was hidden! Demo Ring #14: The Appalachian Air Canines showed their frisbee skills. Many of the border collies of this group were rescued from shelters. Now their seemingly boundless energy is directed into the highly active sport of frisbee. In fact, their energetic natures makes them extremely good at frisbee. The Air Canine demonstrated some of the frisbee games they play every day. One of them is called the Dartboard Game. The handler tosses a frisbee and the dogs try to catch it. What makes it a "dartboard" game? The mat has different colored rings, like a dartboard, and the dogs must land in the "bulls-eye" after catching the frisbee. The closer to the bulls-eye they land, the more points they score. At the end of the Main Hall, the Keystone DockDogs defy gravity as they catapult themselves off a dock into a pool, leap as far as possible. Some of the dogs seemed to hover in the air before splashing into the water. To get the dogs excited and to encourage them to leap into the water, handlers throw the dog's favorite toy into the pool. As one dog made the big leap, he snagged his toy right out of the air - mid-leap - and splashed into the pool with the toy firmly clamped in his mouth. It was quite a sight to see! On the stage, SSD Gideon demonstrated the skills of a service dog. He retrieved a box of mac 'n' cheese, delicately picked up a pair of sunglasses, and picked up a pen, ladle and coffee mug. He even slipped under a chair to retrieve a mitten - without upsetting the chair. Many of the service dogs' skills bring a sense of safety and security to the individuals they serve. SSD Gideon can locate a cordless phone, a skill that makes individuals feel much more secure in their independence. They know that their service dog can always retrieve the phone if they need to call for assistance. SSD Gideon also demonstrated how he can shop, giving the payment to the store clerk, accepting the purchases and taking any change. In Ring #9, pooches shimmied under the limbo stick in the Dog Olympics Doggy Limbo. With the bar down to mere inches above the ground, only the smallest dogs were squeezing underneath. In an open space near the rings, a tired dog stretches out on the cool cement floor and gets a belly rub. Just a little piece of doggy bliss after a long morning of games and fun. This was just a brief snapshot of some of the activities going on at any one time during the day. To truly experience the canine activity, come to PawsAbilities on Sunday. We have another impressive line-up of activities: more Keystone DockDogs, Olympic games, and demonstrations. New for Sunday will be Flyball Dogs Anonymous and the Great Biscuit Bite-Off, judged by our very own service dogs! The Keystone DockDogs always make a splash at PawsAbilities, and now they're doing it live! You can watch them leap off the dock, jump as high as they can, and swim with the speed to rival any canine Olympian. Visit www.pawsabilities.net/live to see these dogs soar! On the stage at 1 p.m. will be the Dog Scouts of America. You can watch it at www.pawsabilities.net/live. Bill Berloni, the famous animal trainer who has trained dogs, cats and other animals for Broadway, movies and television, is taking the stage with Chico the Chihuahua star from Legally Blonde The Musical. Watch them at 11:30 a.m. as they share their experiences on Broadway. Bill is also talking about his latest book, Broadway Tails, about the animal talent he has "discovered" and brought to the limelight. Live on the PawsAbilities stage, K-9 Loki and Detective Dennis Woodring share how Loki sniffs out accelerants, such as gasoline and kerosene, at fire scenes. Watch at www.pawsabilities.net/live. The SSD service dogs are showing off their skills on the stage. Learn more about what these amazing dogs do: www.pawsabilities.net/live. All day today, we'll be bringing you updates on all the happenings at PawsAbilities. Next up on the stage is SSD, presenting about clicker training. Watch it live at www.pawsabilities.net/live at 10 - 10:30 a.m.
PawsAbilities Live from the Farm Show Complex! Coming to you live from the Farm Show Complex, Susquehanna Service Dogs brings you PawsAbilities! Watch the action on our live video stream at www.pawsabilities.net/live. Are You Ready for All the PawsAbilities? 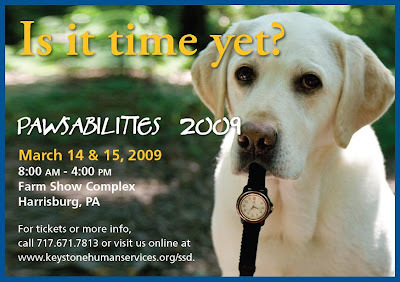 PawsAbilities starts tomorrow at 8 a.m. at the Farm Show Complex in Harrisburg, PA.
What are you going to do at PawsAbilities 2009? Get ready. It all starts tomorrow! PawsAbilities starts today! Come to the Farm Show Complex in Harrisburg, PA from 8 a.m. to 4 p.m. to experience all the PawsAbilities! Compete in the Dog Olympics, make a splash with the Keystone DockDogs, meet famous animal trainer Bill Berloni and canine star Chico, shop in the Canine Marketplace, meet the service dogs and much more! We'll be streaming live video of all the fun each day. You'll be able to watch some of the PawsAbilities events on your computer at www.pawsabilities.net/live. We'll also be bringing you updates on Facebook and Twitter about the exciting events. Be sure to check the wall of the "Support Susquehanna Service Dogs" Facebook Cause and follow us on Twitter at SSDOGS at http://www.twitter.com/. Come on out and unleash the PawsAbilities! Explore the PawsAbilities in the Kids' Corner! PawsAbilities has something for everyone! Bring your kids and dogs to the Kids' Corner for a barking good time! There are activities for every kid and their dog. Kids can get their face painted with dogs and paws, make a gift for their four-legged friend or themselves, decorate a yummy biscuit for their dog and play games. New this year is the Scooby-Doo Ring Toss! Toss the ring on Scooby-Doo's ear and win a prize! Kids can also meet and greet a service dog. They'll learn how to approach dogs, "dress" a service dog, take him for a walk and teach him a trick! You will need to buy tickets for each activity - one ticket per activity. Each ticket costs $1 or 8 tickets for $5. If kids complete all the activities, they win a blue ribbon! Join the Abrams & Weakley Parade! Join the parade at PawsAbilities! Sponsored by Abrams & Weakley General Store for Animals and held at 3 p.m. on March 14 and 15, the parade is always a favorite among pooches and people. It's FREE to enter, but in order to be eligible to win a prize, you must register for a number. Ask about parade sign-ups at the Information Booth. Keystone DockDogs Soar with PawsAbilities! These dogs don't have wings, but it sure seems as if they can fly. The Keystone DockDogs are returning to PawsAbilities, and they'll be soaring to even greater heights. You can watch the DockDogs leap over 25 feet off a dock in Big Air, jump over 7 feet to knock down a bumper in Extreme Vertical and swim against the clock in a race to retrieve a Dead Fowl Trainer in Speed Retrieve. You can watch these canine wonders, or if you have a talented pooch of your own, you can enter him to give dock diving a shot. Just visit the DockDogs website for information about pre-registering for a spot in one of the waves, or you can register first thing in the morning on March 14 and 15 at PawsAbilities. Even though the dogs of Keystone DockDogs tend to be larger breeds, don't let your pooch's small size stop him. There have been dachshunds that have attempted the big leap! So sign your dog up to make a splash with the Keystone DockDogs at PawsAbilities! You may just find out that some dogs don't need wings to fly. Last Day to Buy PawsAbilities Tickets Online! Don't forget to buy your tickets for PawsAbilities online! Today is the last day you'll be able to buy them online. But don't worry if you forget or run out of time. You can still purchase tickets at the door. Today is also the last day to register for the Breed Fun Match and the Obedience Show & Go. If you'd like to participate in either of these events, make sure you register online by 5 p.m. today. Also, don't forget that if you preorder Bill Berloni's latest book, Broadway Tails, we'll give you a $2 discount off the price of one ticket. Bill is an animal trainer who has trained dogs, cats and other animals for theater, film and television, and he'll be signing copies of his book at PawsAbilities. Click here to buy your tickets online and preorder Broadway Tails. Last Day to Submit Your Biscuit Bite-Off Recipes! Today is the last day to submit your recipes for the Great Biscuit Bite-Off! If you have some down-home cooking ideas for your dog or if you've concocted a scrumptious recipe that even your canine connoisseur loves, be sure to register for this homemade treat competition. Our very own service dogs will be judging the competition. Simply submit your recipe online to enter! You will also need to buy your admission ticket for PawsAbilities. Click here for more information about the Great Biscuit Bite-Off! Take Home a Squeaky Clean Pooch! Does your dog need a bath, but you just don't have the time or patience to give him one? 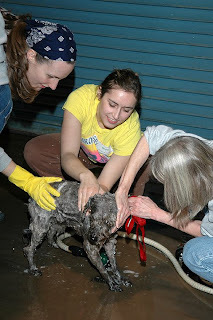 Bring that dirty dog to PawsAbilities' Dog Wash from 10 a.m. to 2 p.m. and let our volunteers wash him for you! After some warm water, doggie shampoo and a good scrub down, your dog will be squeaky clean! Since 1999, Dave and Donna Lindquist and a group of friends have been getting soaked right along with the dogs. They'll be cleaning canines again this year on Saturday, March 14. On Sunday, Bark of the Town, a kennel and grooming shop in Millerstown, PA, will scrub your pups. The Dog Wash costs $5 for small dogs, $7 for large dogs. So if you have a dog in need of a good washing, visit the Dog Wash, located at the end of the Main Hall near the Keystone DockDogs pool in the Pennsylvania Farm Show Complex in Harrisburg, PA. Undoubtedly, you've heard of Boy Scouts and Girl Scouts, but what about Dog Scouts? The dogs in Dog Scout Troop #161 from Cumberland County earn merit badges and participate in community service projects just like their human counterparts. Everything they do builds on the dogs' skills to become well-mannered, welcome members of the community and educates the human "smart end of the leash" in dog ownership and safety. The Dog Scouts have earned badges for hiking, backpacking, water safety, painting and much more. Recently, Troop #161 donated a HeatAlarm Pro K9 vehicle safety system to the Cumberland County Sheriff's Office. This system alerts the officer when the vehicle gets too hot for the dog and turns on emergency fans in the vehicle. The Troop is now working to raise funds for their Pet Oxygen Mask drive. Their goal is to equip all local fire departments with sets of oxygen masks designed to fit cats and dogs. Check out their information booth at PawsAbilities and help them give local fire departments the ability to save even more lives. 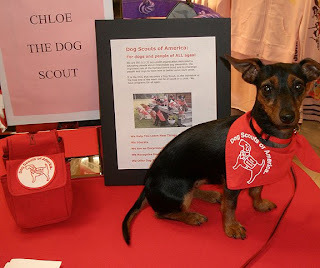 Anyone can be a member of Dog Scout Troop #161 just by joining Dog Scouts of America and participating in Troop activities. If you want to earn the official title of Dog Scout, you and your dog will need to take the Dog Scout Test to demonstrate that your dog is well mannered and a welcome member of the community. In addition, you will have to demonstrrate that you have the skills and knowledge to be the "smart end of the leash." For more information about Dog Scout Troop #161, visit their website at www.fieldwooddogtrainingcenter.com/DSTroop.htm or contact Troop Leader Ann Withun at ann@withun.com. A Rags to Riches "Tail"
Once upon a time, there lived a Chihuahua named Chico, who lived in a shelter in Newark, New Jersey. He spent most of his time chained up, and as a result, he became bitter and angry, growling and biting like a guard dog. Then one day, a man came to the shelter. This man, named Bill Berloni, was an animal trainer, and he was looking for a Chihuahua to play Elle Woods' beloved pooch Bruiser in the Broadway show Legally Blonde The Musical. No one would think the little Chihuahua that growled at everyone would be chosen for such an important role, but when Bill saw Chico, he knew this little dog was destined for stardom. Bill rescued Chico from the shelter and gave him all the love that had been missing from his life. With love, understanding and training, Chico was soon stealing the limelight on Broadway. Now Chico will be stealing the stage at PawsAbilities, where he and Bill Berloni will share Chico's rags to riches "tail" and their experiences in show business.